After reading Pricksongs and Descants last year, I made an immediate decision to acquaint myself more thoroughly with Robert Coover’s work, a resolution I was quick to keep in the new year with the purchase of his most recent novel, Noir. 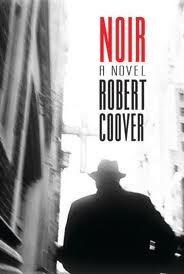 As the title suggests, Noir is Coover’s playful pastiche of the hard-boiled detective genre. (Coover has spoken about “the linguistic and structural fun it offers”). Written in the second person, it casts the reader as Philip M Noir, a private investigator hired by a beautiful but mysterious woman (of course) to track down her husband’s killer (if indeed he was killed). To add to this sense of disorientation (which is, of course, emphasised by the use of the second person), the story is not told in chronological order, with the murdered widow whose body Noir is hunting appearing more than once in his office. That he also manages to get a tattoo on his rear and bleached pubic hair in the course of the story all adds to the fun (and provides a way of sorting out the chronology). It is certainly true of Coover’s work that “every outcome seems possible”: that is exactly what makes him such a vibrant and fascinating writer. In the late 1980s (when I read a great deal of Scottish literature) I particularly enjoyed two novels by a Scottish writer called Colin Mackay, although I knew almost nothing about him. The first, The Song of the Forest, was a set in Scotland’s distant past in a remote rural community; it was noticeable for its mythic, poetic style (I have since discovered it began life as a poem). The second, The Sound of the Sea, had a more contemporary background in the Falklands War, but also drew on the experiences of his father in the Second World War and his grandfather in the First. I was aware he had written a third novel, House of Lies, but had not bought it at the time of publication (1995) and as it soon fell out of print, it almost fell out of mind. 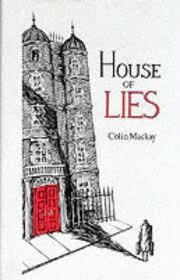 Nevertheless, every so often I remembered this ‘lost book’, even retaining a picture of its stark black and white cover with its rather lurid use of red in the aforementioned house’s door and the word ‘Lies’. It was only after reading it, when I decided to research a little into Mackay’s background (now so easily done online), that I discovered that House of Lies was his last published novel (though not the last he wrote), and that he committed suicide in 2003. (You can find out more about his work and read an interview here, and read his obituary in the Scotsman here). His autobiography, Jacob’s Ladder, written after he had decided to take his own life (It’s first sentence is, “Soon I will be dead”), is available online here. It may also be intended as a way of grounding the supernatural story which follows in contemporary reality, but, never returned to, it seems a misleading introduction. This fits well with Mackay’s satirical intent, but too many other elements muddy the waters. Burns, we discover, is not representative of the working man, but a union leader who neglected his daughter after his wife’s death because of the ‘big strike’. Coming half way through the novel, this leaves the reader slightly unanchored in the narrative. The other characters are caricatures of unpleasantness and self-absorption which can make the satire seem rather heavy-handed. Even the haunting of the house is not dependant on the fall of the Berlin Wall or the arrival of the statue, but has been going on for many years. Not only did it lead to the suicide of the previous caretaker after he had murdered his own daughter, they now seem to do most of the haunting. In other words, there is rather an excess of the supernatural in the novel, and with so many people being haunted, there is no other explanation than that the house is riddled with ghosts. One might also question the target of the satire: exactly how many people in the UK, ten years after Margaret Thatcher came to power, still believed whole-heartedly in the Soviet Union? And were they really so powerful and dangerous that they needed bludgeoned (literally as well as metaphorically in this novel) by such a talented writer? Because talented Mackay certainly was, and the risk-taking of this novel alone (a horror / political satire cross-over) proves that he still had an enormous amount to offer. 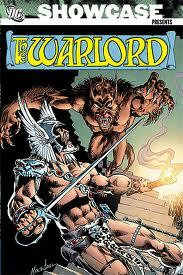 You are currently browsing the 1streading's Blog blog archives for January, 2012.